When hosting an event or party for your corporation, you want to create an atmosphere that “wows”. A Casino Vegas party is exactly what you need to keep your guests entertained. Your event can be complete with bartenders and a poker tournament. The possibilities are endless fun! Only the finest equipment and service is offered at Aces Up. 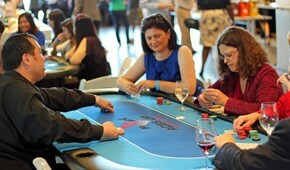 You’ll pleased from start to finish when you choose a Casino Party here in the San Francisco Bay area. It’s easy to get lost in the day to day of corporate life, hosting an event that bring Vegas to your colleagues is a sure fire winner. Our customer service is top notch and professional, contact us to book your casino party now.